← #AdventBotany 2016 – Day 2: How do you create a Candy Cane Chrysanthemum? #AdventBotany 2016 – Day 3: A sweet surprise! Happy birthday to me, Happy birth… hold on just a minute this is the 25 days Advent Christmas Botanical Calendar, so why the birthday? My birthday does indeed fall on the 3rd day and like anyone else I do love a cake. 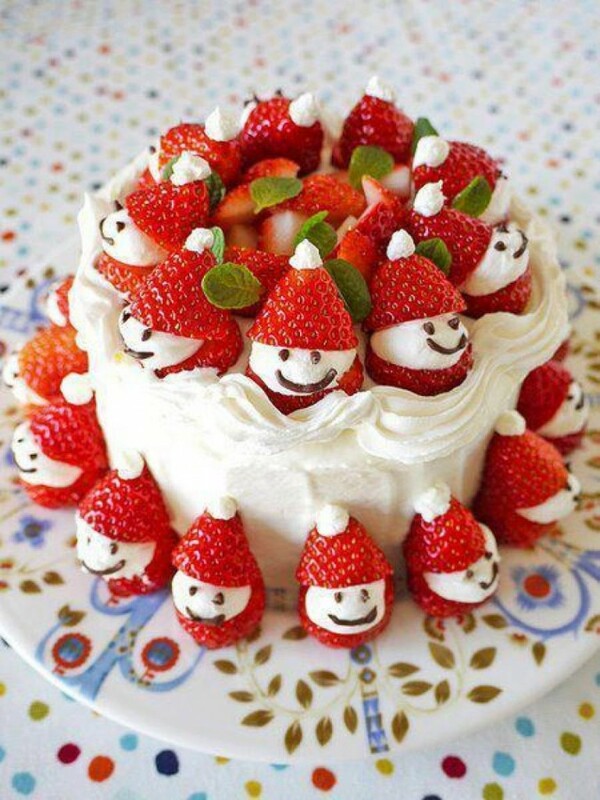 But the cake for today is a Japanese Christmas Cake. 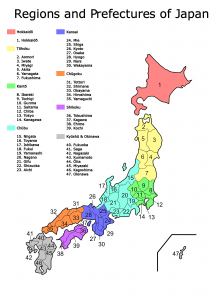 However, Japanese do not celebrate Christmas so the 25/26 December is not a national public holiday but it doesn’t stop them celebrating or eating cake. 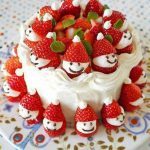 So move along you traditional Christmas cake ingredients cinnamon, nutmeg, cherries and sultanas, it’s time for the strawberry! The strawberry I hear you cry as you think hot summer days and Wimbledon Tennis! Yes, the strawberry! This cake is lush. It can be any shape you want and is easily made. 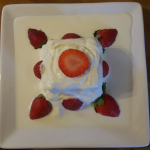 Make a light sponge, cover it with lashing of whipped cream and decorate with strawberries. For those of you with Masterchef skills variations on this theme abound . Now I have tantalised you with the cake, let’s go ‘hug’ the strawberry (don’t get it on your clothes now!). 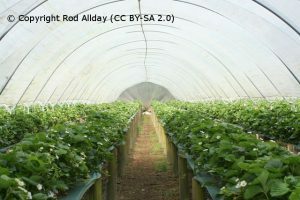 Fragaria x ananassa commonly known as the garden strawberry is an artificial hybrid between Fragaria virginiana Mill., the scarlet strawberry from Eastern North America and the walnut sized fruiting species Fragaria chiloensis (L.) Mill., the beach strawberry from Chile. 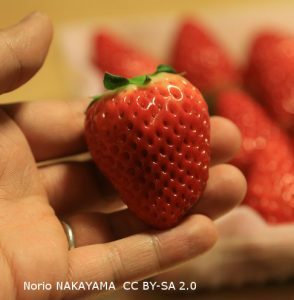 The word for strawberry in Japanese is ichigo. And how about my attempt at making my Japanese Christmas / Birthday cake? Not bad for a first try – beginners luck as usual! Fi Young is an alumnus of the UoR MSc. Plant Diversity degree (2007-2009). When Fi is not in poor mental health she is a Committee Member, Winnersh Parish Coordinator and tree hugger for the WDVTA, a Coursera.org Volunteer Mentor for the Johns Hopkins University Data Science Specialism: Capstone Project and a School Governor. Fi continues her scientific projects online at www.lacistemataceae.org. This entry was posted in Advent, Public Engagement with Science and tagged Amaou, Christmas cake, Fukuoka and 'Hinoshizuku, Kumamoto, Nyoho, Tochi, Tochiotome. Bookmark the permalink.